I lost my deaconess pin. Again. And I started on a downward spiral of berating myself for losing something so special. Blessedly, before I got too far down, I interrupted myself and was able to reframe the loss in a way that gave me peace. Don’t get me wrong, the deaconess pin—made of real silver—is very special. I received it as part of the consecration rite in which I officially became a deaconess. Each of us, as deaconess students, look forward to the day when we will get to wear the pin. The basin on the crossbar is a reminder of the basin Jesus used to wash his disciples’ feet. It is in that spirit that deaconesses serve the church and the world. The deaconess pin is an important reminder of our servant-hearted ministry. And wearing the pin is a great conversation starter with folks who don’t know about our ministry, or about the love of Jesus—the source and model of our serving. But sometimes even important things get lost. What really turned around my thinking about losing my deaconess pin this time (it is the third pin I’ve lost), was when I paused and remembered the stories of other deaconesses I admire who have lost pins more than once. “I’m in good company,” I told myself. What’s more, part of why I lost my pin was because I was wearing it a lot. I wore it everyday (and every night) that I went to spend time with my mother-in-law, Elaine, in the hospital before she died. I wore it everyday that I planned meals for the Tinker family in the days surrounding Elaine’s death and funeral. I wore it to remind myself that what I was doing was, in fact, ministry. It wasn’t some ground-breaking innovation in church-work, nonetheless it was ministry. It was ordinary, everyday ministry. So, the clincher for me was the realization that I lost my pin because I was…using it. It reminded me of my attitude about the “good dishes.” I know some people have the idea that you don’t want to use the good dishes because something might happen to them! But my thinking is, if I’m never gonna use my good dishes, then why do I have them? What good are they? I mean, sure they can sit there and look pretty. But tucked away in a china cabinet, they’ll be quickly forgotten—out of sight, out of mind. And even their beauty will fade into the background. They will be safe though. 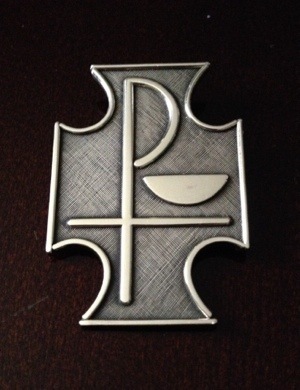 Of course, my deaconess pin, like the good dishes, was vulnerable by being used so much. But what good is it if I don’t wear it? It would be safe in one sense, but not wearing it is its own kind of loss. And you know all those nights I spent with Elaine? I made myself vulnerable by being of service in that way—my sleep was often interrupted, I was away from my husband and son, and I lived out of a couple of bags for 3 1/2 weeks. Most of all though, by being there with Elaine—by spending so very much time with her—I came to care more and more deeply for her. And while that bond being strengthened was its own reward, it also made me more vulnerable to the pain of losing her. But I wouldn’t exchange that experience for the finest china. No amount of silver could replace the ways my life was enriched by being there with Elaine in that time. I took risks with that pin. And I lost it. But what I gained made it all worthwhile. My mother-in-law, Elaine Marie Oslund Tinker, died on Wednesday, October 8 and I feel a bit like nothing is quite as it should be. And yet, the rest of the world is moving on just fine. And I just can’t can’t right now. I have to keep putting one foot in front of the other. And life is going on. My life is going on. And that’s as it should be, but it doesn’t feel like it should be. There’s part of me that wants to just stop. To just make everything stop. And that part of me is dragging me down. And it’s making me not want to write. I deliberately gave myself permission to not write when I was spending so much time caring for Elaine and when we were all caring for one another in the time after her death. Those were the days–or hours–that we all just took one at a time. Writing, though integral to who I am and what I’m doing, writing just had to wait for the most part. And even now I’m not entirely sure what to say about those days. And part of me feels like I can’t. But I just can’t can’t. I have to say something even if I don’t know what I’m saying. And the “have to” is not some weird pressure I’m putting on myself. I promise. I would tell you if that was what it was. The “have to” or the “can’t can’t” is this feeling deep down that I know, know, know there is more for me in life. I said before that I felt like everything in my life prepared me for my ability to be present with Elaine as I did–I felt that same sense throughout even the worst of her illness and even in her dying. And as much as I felt like all my life prepared me for what I’ve just been through, I feel as though what I’ve just been through has prepared me for more, more, more. 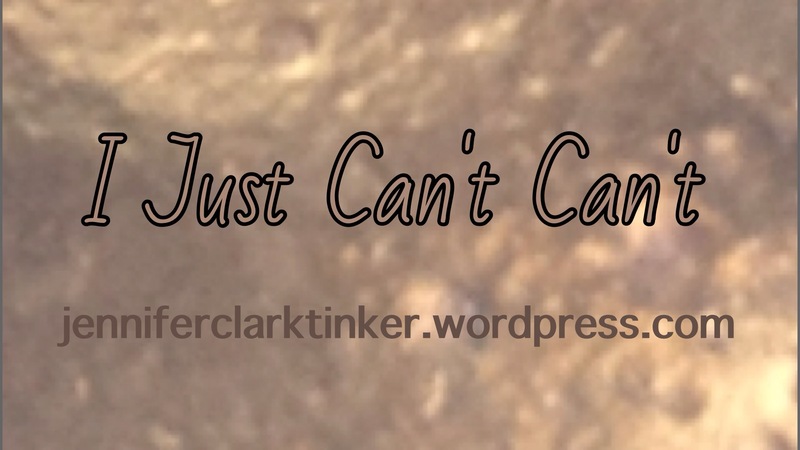 And so, I just can’t can’t.